Us Two Plus You: Finding my family at the cost of my friends.. I have started and stopped writing this post for months. Many times I simply told myself to just bin the whole idea and just get on with other posts because truthfully I didn't think I was brave enough to hit publish, I am still not sure I that I can hit publish. However I know that I need to write it regardless of if anyone else can see it. So here goes. For many mothers out there there comes a time in motherhood where you simply ask yourself 'What happened to my social life?'. This is a question I really struggle with, I am not in anyway a confident person in myself. Even though I do feel a confident parent. How crazy does that sound?! But really what I mean is that I am comfortable being a mum and I might not always know what I am doing but I know that in the end I will get there. 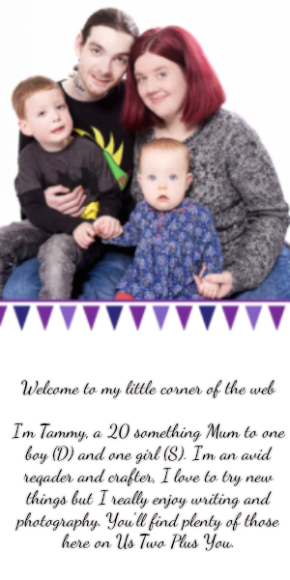 I can talk about being a mother to anyone and I can certainly hit the publish button on any post I write about being a mum and my life with D and Simon. Much like many other friendships after we all left school we started to slowly drift apart but somewhere during this process we seemed to start finding each other again. There was so much going on in all our lives but we managed to find time to meet up and go out together. Something changed after a while and I now know what that was. It was me, I was so excited when I found out I was having D as so many other parents are. I knew becoming a parent would change my life in so many ways but I don't think I was really prepared for what happened. I was almost bursting with excitement as I waited for my friends to arrive. I wanted so badly to scream from the rooftops that I was pregnant but I couldn't. In the end it all came out and I don't think I will ever forget the look of sadness in the eyes of my two best friends. They where sad! Yes they where sad while I was bursting with happiness at the prospect of starting my family with the man I loved. It took so long for me to come to terms with the fact that they didn't want to even pretend to be happy for me. They couldn't just smile and pretend they where happy that this was going to happen. One thing from that night that sticks with me is them both asking me if I was sure that this was what I wanted. Did I really want to be a mum. We had all often talked about being parents and they knew, of course they knew that I wanted to be a mum. It took around 10 months for me to see them again after that. We had said so much that hurt and there wasn't anything left to change any of our minds. After D was born they came to visit, much like anyone does once a baby is born. You visit, you compliment, you leave. That is exactly what happened. For months I was so busy just being a mum and I never stopped to ask myself when will I see my friends? The truth is we are now just passing strangers. We stop to talk when we pass each other in the street and we say 'let's meet up soon and make plans to see each other'. That day never seems to come and honestly I think it may be my fault. I don't know what to say. I know nothing about my two best friends anymore. I don't even have the confidence to have a lengthy conversation with them no matter how desperately I want to. Believe me I do. I think about them both often and I remember the friendship we once had. I miss that friendship, I miss our long conversations about anything and everything. I miss leaving to have coffee or go for a night out. I just miss having a friend. I never made new friends, I simply can't walk up to anyone and say 'Hello'. I don't know how to start a friendship. That scares me, I really wish I could teach myself how to make a friend. A real true friend. One that I can meet for coffee and tell them all about the things I do, I can listen to what they have to say. Instead I think about all the reasons I don't have a friend to simply sit and talk to. I just feel guilty that D may be losing out because I don't have the confidence to take him places where I will be alone with other people I don't know. Is it my fault that D doesn't have friends other than members of our family? I honestly don't know. He has some fantastic social skills though so I do doubt that and I think he will make friends throughout his life with ease so I try not to dwell on the fact that right now his friends are people who we are related to. I hope that if you have lost a friend or more by becoming a parent that you are happy. That is what really matters. Friends or not just be happy. I am and I plan to continue to be happy with or without friends beside me. I know many people and I regularly will consider these people friends but I do only know many of them online and that is fine. We talk and support each other through the Internet. However I am talking about a different type of friendship here. Quick update: I can't quite believe I am ready to post this. It's been a while since I wrote this post and I think I now have the confidence to actually hit publish. Awesome post. Really, really, really brave of you to do this. I read this post and a part of me died inside. I had a tremendous social circle of friends before I got married and had children, but I've been relegated to seeing one of them, once a month or so perhaps. Saying that I have met new people and moved on a bit since then; I think we tend to get slightly nostalgic in our old age. And perhaps, when those friendships weren't as great as we'd like to remember - we always view them with rose tinted glasses. After all, a friend is better than no friends, right? Don't worry - I'm sure you are an awesome, awesome person and when the moment comes, you'll meet a friend just as awesomey as you. I lost most of my friends when I had Caleb. I have two friends that I see once a month which is lovely. We should have a play date sometime :) Caleb and D would get on well I think! Thank you very much Raymond. I must admit I don't feel very brave. But it took a long time to finally hit that button. I know now that I not only lost my friends but I gained so much more in having my family. It was a loss that I think we all feel to an extent. Mine was a bit more pronounced with my only having two friends and that's what really hit me hard. I have met some really amazing people who truly inspire me in the last few years although many are online. I do have a very large family that are very close so I see my sister a lot but it's a different kind of relationship as we are related. Thank you for coming and taking the time to comment. You have made me much more confident in my decision to share this. Thank you. Yes they certainly do change our friendships as much as they change our lives. It was a big shock that they didn't really understand my joy of being pregnant or share in it and I think that's partly why I remember so little about that night other than our fight and their disappointment. I can't imagine how it would feel if a friend had been going through the same life changes and not still been there at the end. I guess it just works out differently for some people. I am starting to realise that it wasn't all my fault and yes I may have played a role by not being readily available to meet up. But really I was trying to figure out how to be a good mum and that will always be a first priority for me. I am hopeful of finding new friends and of having a good reliable relationship with them. I just know it won't happen right away but that's okay. Thank you for coming over to the blog and sharing your own experience with me. It's nice to know I am not alone and that other people have experienced something similar.